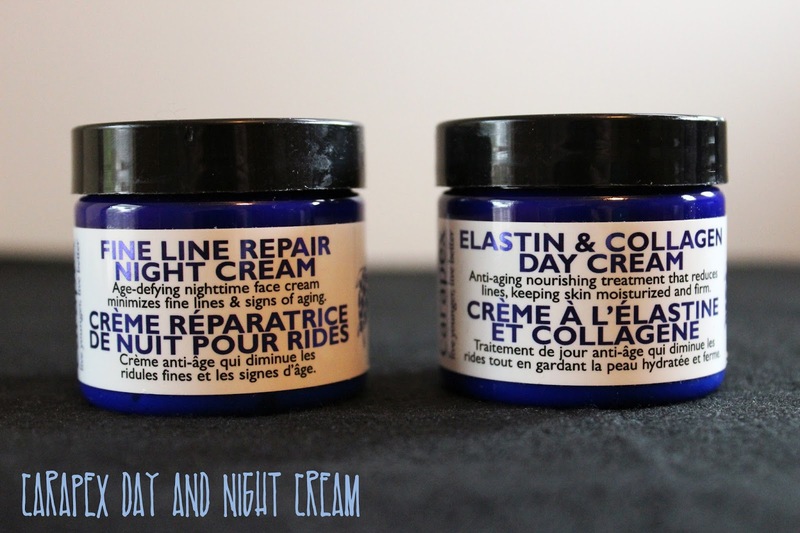 I'm all aboard the wrinkle-prevention train lately, and for the past couple weeks I've brought Carapex Elastin & Collagen Day Cream and Fine Line Repair Night Cream along for the ride. I was sent these to sample, and I have to admit, I didn't have very high expectations for what they'd do for my skin, but I have to say, they've both FAR exceeded my expectations. First and foremost, let's start with the Elastin & Collagen Day Cream ($34.99 for 2 oz). For one, it's all natural (hooray - you know I love that!). Obviously, it's infused with elastin and collagen, two ingredients that smooth the skin, and restore youthfulness. Other great ingredients in the day cream include: natural shea butter, aloe leaf gel, grape seed oil, avocado seed oil, jojoba seed oil and vitamin E (all of which moisturize and heal the skin). The day cream is fragrance free (love! ), paraben-free, harsh chemical-free, and never tested on animals. It's a great moisturizer and is light enough to apply makeup over without any issues. Overall, this cream should plump, moisturize, soothe, and reduce the appearance of fine lines and wrinkles. The Fine Line Repair Night Cream ($34.99 for 2 oz) is also a natural product, free of parabens, fragrance, harsh chemicals and is never tested on animals. This cream aims to diminish signs of wrinkles and fine lines, as well as soften the skin. Much like the day cream, it has fabulous ingredients like natural shea butter, aloe vera, avocado oil, jojoba oil, olive oil, and vitamin E.
As you can see from the image above, the night cream is thicker than the day cream, but it doesn't leave my face greasy in the slightest. Each morning when I wake up, I've been so shocked by the even tone of my skin and how soft and supple my skin feels. So remember when I said I had low expectations of these creams? I should just slap myself. I have been FLOORED by how much my skin loves these creams. Rarely do I see any noticeable difference in my skin when I switch up products (apparently my skin is an equal opportunity tester -- only breaking out when it hates something), but I have seen an actual change in my skin's appearance. The pores on my skin are smaller, my makeup glides on with ease and looks flawless, dry patches have been healed and oil has stayed at bay. I am a freakin' believer in the combination of these two creams, and I will absolutely continue to use these when the sad day I run out of these comes. You can purchase these at Carapex.com or on Amazon! 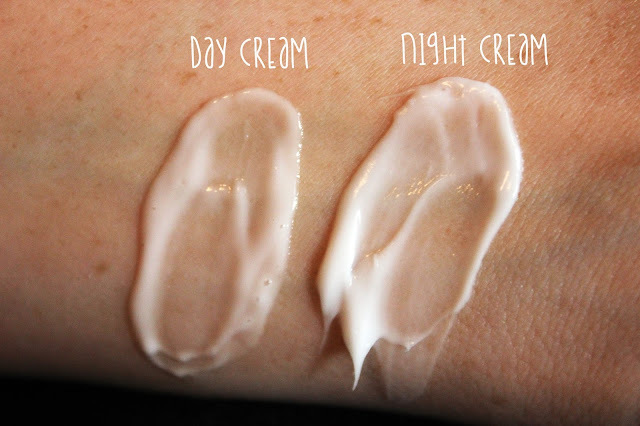 What's YOUR favorite day/night cream combo? Let me know!